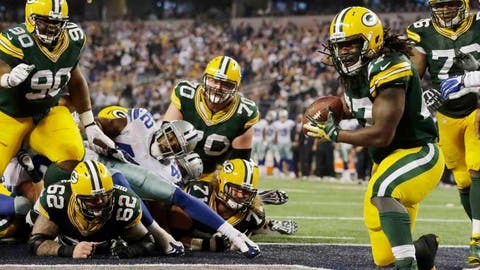 Green Bay Packers running back Eddie Lacy scores the winning touchdown against the Dallas Cowboys. The Packers were down 26-3 at halftime. That’s the type of deficit that NFL teams are never supposed to overcome. Appropriately, the statistical win probability for Green Bay at the beginning of the third quarter was six percent. With 3:52 left in the third quarter and the Packers down 29-10, their win probability was three percent. Game over, right? It should have been. However, Green Bay scored a touchdown on every meaningful second-half drive, totaling 312 yards in those series. The Cowboys’ defense, which came into the game ranked no better than 26th in the league in any major category but played surprisingly well in the first half, showed its true colors in the second half. After Matt Flynn took a knee on the final three plays of the game to run out the clock, the Packers had completed one of the two biggest comebacks in franchise history. On Sept. 12, 1982, Green Bay was down 23-0 at halftime to the Los Angeles Rams before the Packers scored 35 unanswered points for the victory. Only two Green Bay players involved in Sunday’s win over Dallas were even alive at that time. John Kuhn was three days old, while Ryan Pickett had just turned three years old. The other 51 players currently on the Packers’ active roster were still a ways away from acquiring a birth certificate. Unless Tony Romo wins a Super Bowl before he calls it a career, the Wisconsin native will be remembered by most NFL fans as the quarterback who just couldn’t get the job done when it mattered most. Romo has been the Cowboy’s starting QB for eight years, but he has just a 1-3 playoff record. While it’s unfair to pin postseason record entirely on a quarterback, Romo would obviously be viewed much more favorably as a top-tier player if he had more success in big games. Well, this wasn’t a playoff game, but the Dallas loss significantly hurt its postseason chances. The Cowboys’ play-calling was suspect, but coach Jason Garrett said after the game that Romo optioned out of a called run on the play that was intercepted by Sam Shields. That’s on Romo. The Packers deserve a lot of credit for forcing Romo to do the thing that he is so well known for: costly turnovers late in games. Interceptions were exactly what Green Bay needed to pull off this win, and Shields and Tramon Williams both delivered one in the final three minutes of the game. Flynn had no other options on the table when the Packers signed him Nov. 11. He had already been released by the Oakland Raiders and Buffalo Bills this year, and it appeared possible that his career was over. But, with Flynn’s familiarity with Green Bay’s offense, general manager Ted Thompson scheduled a workout with the team’s former QB and brought him in as Scott Tolzien’s backup. That has turned out to be the right call by Thompson and his staff. When the Packers were down by 13 in the third quarter against Minnesota on Nov. 24, coach Mike McCarthy’s decision to bench Tolzien and bring in Flynn has turned out to be the right call. Sticking with Flynn as the starting quarterback, despite his horrible performance on Thanksgiving in Detroit, has turned out to be the right call. Flynn’s second-half performance is exactly what Green Bay needed, and it was a season-saver for the team. Flynn threw four touchdown passes in the second half, didn’t throw an interception and certainly didn’t look like a quarterback who is — in many ways — just lucky to have an NFL job right now. It’s possible that Aaron Rodgers returns next weekend against Pittsburgh, and even if he does, the Packers will have to thank Flynn for keeping their season alive when it was on life support. Statistically, Green Bay now has a 19.6 percent chance of making the postseason. Those still aren’t very good odds, but it can all change very quickly. With a 7-6-1 record, the Packers trail the Chicago Bears (8-6) for the NFC North lead. Detroit (7-6) plays on Monday night against the Baltimore Ravens, with a Lions win putting them back in first place and dropping Green Bay to third place. Winning a wild-card spot is not possible for the Packers, so they need to win the division to get in. If Green Bay wins its final two games (which includes a Week 17 matchup in Chicago), the Packers would finish with a better record than the Bears. But Green Bay still needs help from Detroit, because the Lions control their own playoff destiny. Another scenario: If the Packers win next weekend over the Steelers and the Bears lose at Philadelphia, Chicago would still win the division if it defeats Green Bay in Week 17. The Packers should be very, very thankful that the Cowboys forgot to run the ball late in the game. Green Bay’s 25th-ranked rushing defense couldn’t stop Dallas running back DeMarco Murray, yet the Cowboys passed the ball 48 times and ran it just 18 times. Murray torched the Packers to the tune of 18 carries for 134 yards (7.4 average) and one touchdown. So, this continues to be a huge problem for Green Bay’s defense, which wasn’t able to follow up its decent performance a week earlier against Atlanta. The Packers are fortunate to matchup with Pittsburgh’s 31st-ranked rushing offense next Sunday, but if Green Bay doesn’t correct this issue, Matt Forte will once again have his way in Week 17, like he did on Nov. 4 with 125 rushing yards.